Consumer Affairs Department Rajasthan Issued a Advertisement For Recruiting 27 Inspector.All Eligible & Willing candidates Can Check Detailed Advertisement From Their Official Website And Apply Online / Before 10-07-2017.Eligible And Interested Candidates Can Check Detailed Information For Each Postion Such As - Eligibility Criteria, Qualifications, Age Limit, Selection Procedure Before Applying. 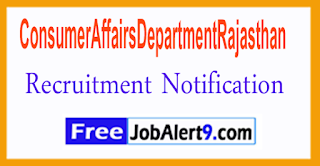 Consumer Affairs Department Rajasthan Recruitment 2017. Salary And Grade Pay Scale: INR Rs.9300 - 34800/- With 3600/- Grade Pay. Candidates Must Pass Diploma, Graduation Degree or its equivalent qualification A fromS recognized Board / University. Candidates may fill the online application through official website (http://www.consumeraffairs.raj.nic.in). 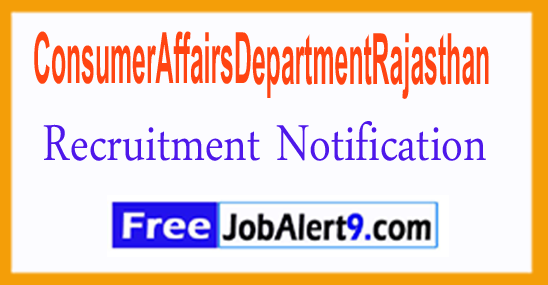 before /( 10-07-2017).
. Click Here For Consumer Affairs Department Rajasthan Recruitment 2017 Detailed Advertisement.